Over the past week or so we’ve seen a few stories regarding wet bodies in our solar system. First, there was news about water on Mars. Now the news wasn’t so much that there was water on Mars, since that’s been pretty well understood for a while now (thanks in large part to the rovers Spirit, Opportunity, and Curiosity), rather how much water there was – and it’s plentiful to say the least. Using land-based infrared telescopes (the ESO’s VLT and NASA’s Keck), NASA was able to measure the hydrogen isotopes in Mars’ atmosphere. The results indicate that Mars one had 20 million cubic kilometers of water – more water than is in the Arctic Ocean here on Earth today. 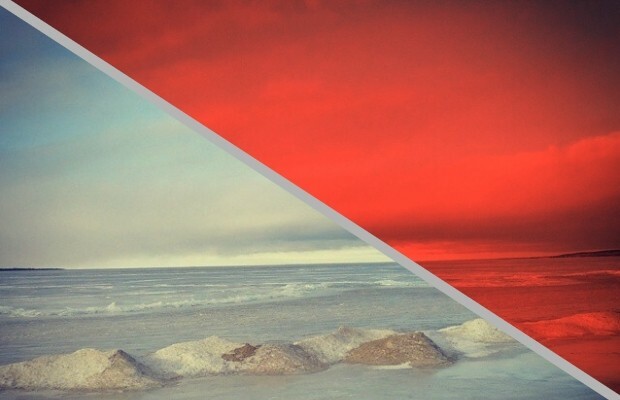 Astronomers are also currently suggesting that the Martian water was contained, mainly, in one large ocean surrounding the Red Planet’s north pole. It would have covered proportionally more of the planet’s surface than the Atlantic Ocean does here. Nowadays on Mars it’s bone-dry, quite a bit different from ~4 billion years ago. 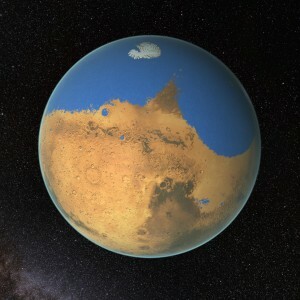 Current estimates suggest that Mars’ ancient ocean contained about 6.5 times more water than what is currently observed in Mars’ polar ice caps, meaning that a great deal was likely lost into space as the Martian atmosphere thinned 2-4 billion years ago (though some water could still possibly be trapped in a permafrost layer). 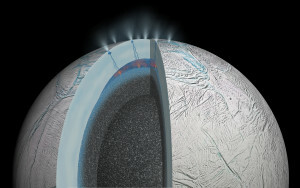 The next news item this week is regarding Enceladus, an icy moon of Saturn. Now again, we’ve understood for a while that this moon had a sub-surface ocean of liquid water, trapped beneath an icy crust, but the news this week is tantalizing: the possibility of active hydrothermal vents in the moon’s southern ocean. Announced just a couple days ago thanks to data from the Cassini spacecraft, astrophysicists have been able to pinpoint the origin of tiny particles of silica that the spacecraft had been detecting in space as it orbits in the area. And the origin appears to be the southern ocean of Enceladus, a 10km deep body of water. How the silica particles form is a chemical process that takes places when ocean water interacts with volcanic activity on the ocean floor. Precisely the same process has been observed in only one other place so far: right here on Earth. And on our world, hydrothermal vents are teeming with life. Jump ahead to today, and NASA announces, using Hubble data, that the largest moon in our solar system has a sub-surface ocean of liquid water of its own. 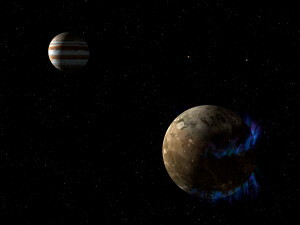 Ganymede, a moon of Jupiter, has been theorized to have a sub-surface ocean since the Galileo probe visited the area in 2002. Shifting magnetic fields were a major clue indicating the presence of water, though the data at the time was inconclusive. But now a novel idea has allowed a team of astronomers to make use of the Hubble Space Telescope to study Ganymede’s shifting magnetic fields from afar: patterns in the moon’s auroras. With all this in mind – and not to mention other wet worlds, like Europa – the solar system is starting to look a little more damp than it was once thought to be. And here on Earth at least, it is well understood that anywhere you can find water – in any form – you are virtually guaranteed to find life as well. So how do these discoveries impact the prospects for finding life in our solar system beyond Earth? On Mars, I’m not sure it changes much. It’s been understood that the planet was once wet, that it was wet for hundreds of millions of years (if not a billion or more), and that the environment was once life-friendly. This week’s discovery drives home the idea that there was plenty of water, but I don’t know that it’s a game-changer. Ganymede? Add it to the list of worlds with liquid water that require more study. (I would similarly categorize Europa.) Questions abound as to the nature of their oceans, if there is any volcanic activity, do they cover the entire world, and could there be life? Clearly we have some exploring to do. 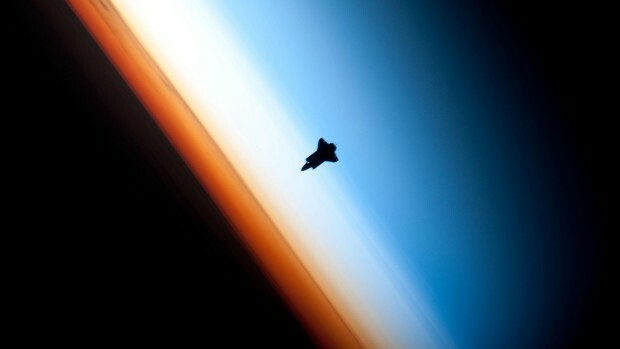 Astronauts on board the International Space Station capture an image of the Space Shuttle Endeavour prior to docking during the mission STS-130 in February 2010 (NASA). The frontiers of exploration have had many faces throughout history. In ages past, what is today London, England would have been a striking, though desolate, find. Today it’s a central hub of the Western world. Ditto my hometown of Toronto, Ontario. Just 300 years ago it was wilderness. And you don’t have to venture very far from the city limits to return to that untamed world. And there are many places around the world that are still, in the truest sense of the word, frontiers of exploration. 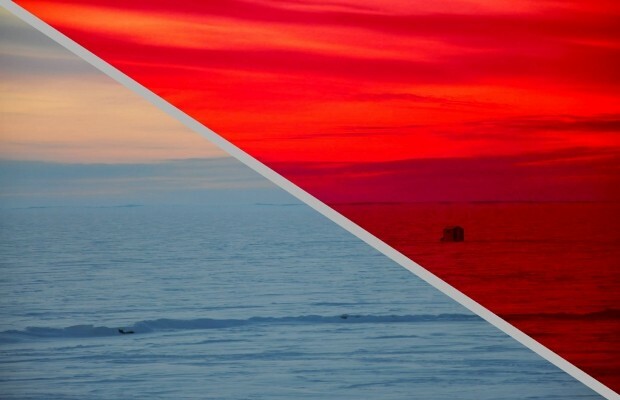 Antarctica, the Amazon rainforest, the ocean floor (a massive ‘new world’ right here on Earth), Madagascar, the high Arctic – all places that most human will never venture and no doubt hold secrets that could both amaze and bewilder our understanding of the world and perhaps life itself. Consider for example the extremophiles (life that exists in extreme environments) that live inside rocks many kilometers beneath the surface – far from any sunlight – that use the rock itself as an energy source. Or the life that persists on volcanos. Or the life that flourishes in Lake Vostok – an underground Antarctic lake that has been cut-off from the outside world for perhaps 15 million years beneath 4km of snow and ice. These discoveries have changed how we think about life, and rightly so. We have learned that life can persist – and proliferate – in places that only a few years ago were considered too harsh. The goldilocks zone right here on Earth has ballooned. Places that were once thought of as too extreme in some way – too hot, too cold, too dry, too little sun – are now all environments where there is life. And significantly, they’re not just places where life is theorized. It’s not just that someone says there ‘could be’ life there. There really is life there. We have seen it. Measured it. Tested it. Compared it. Our exploration has taught us an important lesson for Planet Earth: life finds a way. And as I sit in my chair explore the ice world I see out the window of the house Ashley grew up in, those four words stick with me. I know gazing out the window that my view is teeming with life. In the sky, under the ice, in the snow. Everywhere there is life, and it’s abundant. Our exploration of Earth has proven this to be true. When the first people arrive on Mars in the next decades, the view they’ll be faced with may be remarkably similar to what I see here, sitting in North Bay on the shore of Lake Nipissing. A landscape shaped by the cold, by wind, by water – by weather. It’s a landscape that is utterly beautiful, but also incredibly harsh. The one I see is a present day lake and the one on Mars will be an ancient lake – one that has long since dried up. But I’d be willing to bet that the first people to visit Mars will touchdown at a place where we’re confident there used to be water (and maybe still is, just trapped under the surface in permafrost). Our Martian explorers will lift the veil on some of the secrets of the Red Planet. They will walk and rove. They’ll set up camps and hunker down when dust storms approach. They will keep warm on the cold Martian nights. And as I think about the incredibleness of discovery that awaits our pioneers, it occurs to me that we’ve been here before. This has already happened. Earth used to be the undiscovered country (and in a meaningful way, we’ve only scratched the surface of it). We are born to explore, and now there is a new frontier that tugs at our souls – and our emissaries are already there. But they are only wetting our appetite. Missions to Mars have been flying for five decades. They have answered some fundamental questions – about water, about canals (or lack thereof), about volcanos, about the atmosphere and ancient environment. They have also raised poignant questions, the latest of which – the origin of methane spikes detected by MSL – often circle around the question of life. Was it ever there? What was its nature? When did it emerge? How long did it survive? Is it still there today? Are we related? The answers to these questions – significant in their own right as they help us to understand the history of Mars – are also fundamental in determining our place in the cosmos. Are we alone? Does life jump from planet to planet on asteroids? Is the chemistry of life common? Answering these questions – in either the affirmative or the negative – will have profound impacts. Exploration in the 21st century will take us to new frontiers, but it will similarly be true to our history. Humans yearn to explore, and this is as true today as it was hundreds of years ago. The names of the explorers may be different, the frontier’s further afield, and our ships different in appearance, but these are only superficial transformations. We want to explore new challenges, new destinations, new landscapes, new people – new worlds. What do those places feel like? How do they smell? Is there life? Are there resources that will help people survive and travel on further? Mars, like Earth, is a place that offers endless possibilities of exploration. I wonder what we’ll find. North Bay, Ontario or Nipissing Landing, Mars? 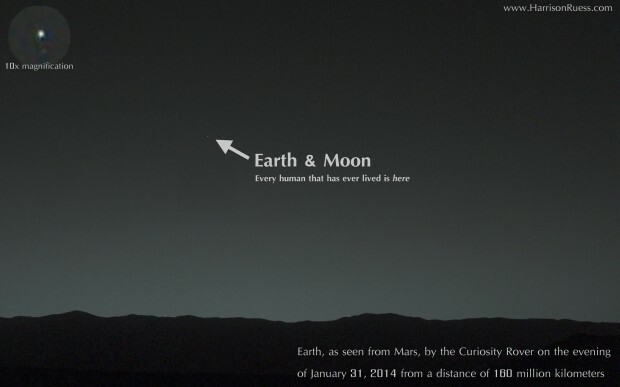 In March 2004, the Spirit rover on Mars captured the first image of Earth ever taken from the surface of another planet. A couple weeks ago, NASA’s newest Mars rover accomplished the same feat, snapping a photo of the Earth and the Moon in the sky of another world. The Mars Science Laboratory (aka Curiosity) captured this image on the evening of January 31, 2014 from inside the Gale Crater on Mars. 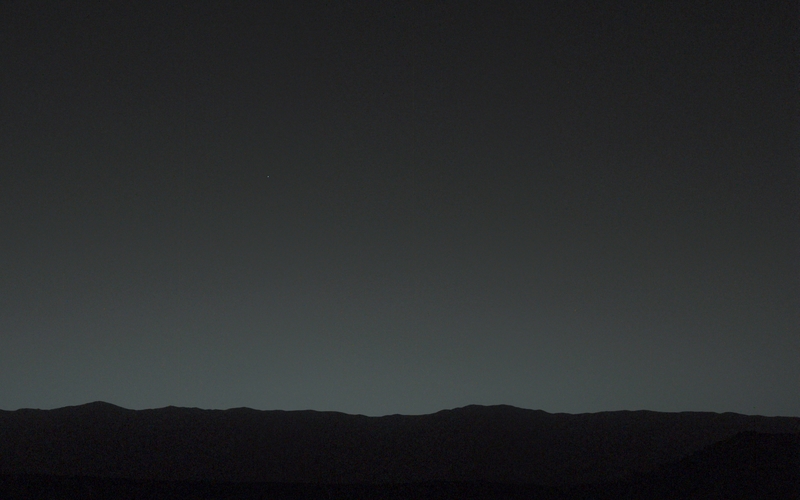 The image was taken using the left eye camera of Curiosity’s Mast Camera (Mastcam) about 80 minutes after sunset. 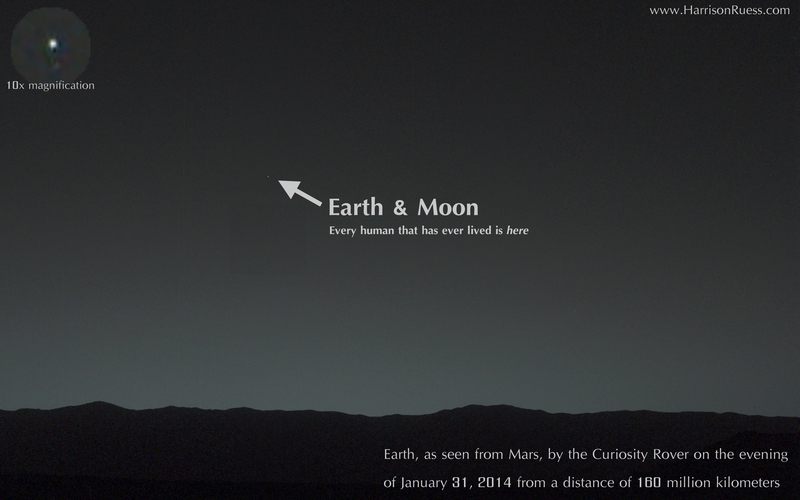 Mars and Earth were 160 million kilometers apart when the photo was taken. If (when) a human is on Mars and looks up into the sky, they’ll see Earth and the Moon as two evening or morning stars – similarly to how Venus appears in the evening and morning sky here on Earth. In this photo taken by Curiosity, the Moon appears just below the Earth as a fainter, though still distinct, object. I particularly enjoy photos like this due to rare the perspective it affords us. To be able to see our entire world, our “vast” civilization, take up only a few pixels in an image from another world is an important reminder that we are apart of something much larger. It makes our problems and petty differences here seem less significant. It provides inspiration for us to aim for bigger, better things. Keep ’em coming, NASA. We all need to see things like this more regularly. And not to be forgotten is the famous Pale Blue Dot image captured by Voyager 1 from a distance of six billion kilometers in 1990. Just ahead of it it’s 10th birthday on the red planet, Opportunity has started a discussion around new rock! 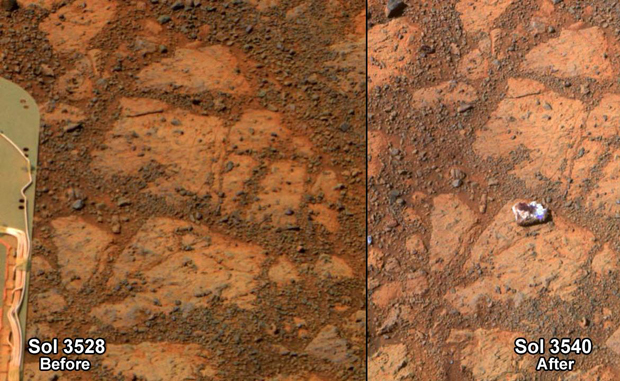 Two images taken of the rover’s work area, taken two weeks apart, show that a new doughnut-sized white rock has appeared – apparently out of nowhere. Currently two theories have arisen as to where the new rock may have come from. The first idea put forward by scientists is that the rover itself may have dislodged the rock with its wheels while driving around. Additionally, the white coloration could be a result of the wheels flipping the rock over and exposing the underside. The new mystery rock has been named ‘Pinnacle Island’ and has excited scientists working on the mission. All the other rocks in the area appear the more typical Mars reddish-brown. The second theory is that a meteorite may have impacted the surface somewhere nearby and this rock, which does look unlike other rocks in the area. The new mystery rock could be a small fragment of the meteorite. The first image of the area was taken on December 26, 2013 on Sol 3528. The second image was taken on January 8, 2014 on Sol 3540. A ‘Sol’ refers to a Martian day, which is 40 minutes longer than an Earth-day. The Sol reference number explains the number of days since Opportunity landed on Mars a decade ago – on January 25, 2004. The images for this mystery were taken using Opportunity’s panoramic camera, or ‘Pancam’. If either theory is true about where this rock came from, what a great opportunity (pardon the pun) for science! Isn’t it great that we have robots out there to investigate things like this? Though the flip side: imagine how much we must be missing because space is very dynamic and we only have a few robots out there watching.